Japanese label N. HOOLYWOOD has come together with California’s Ron Herman to create a simple capsule collection for Spring/Summer 2014. Although typically a casually styled brand, Ron Herman picks up some polish from N. Hoolywood in the form of a blazer, vest and slacks. 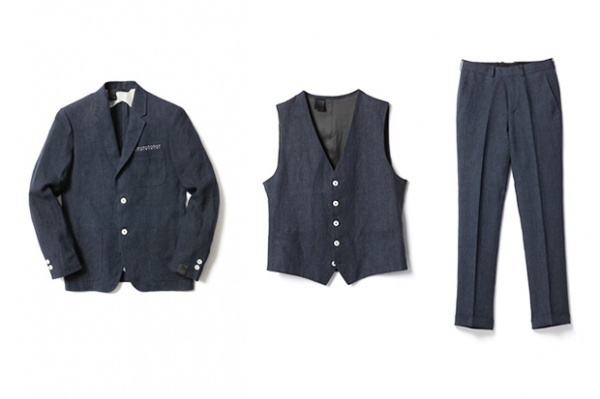 Made from cool, comfortable linen, the pieces will be available exclusively at Ron Herman’s Japan retailers. This entry was posted in Collections and tagged 3 Piece Suit, blazer, California Ron Herman, Capsule Collection, Collection, HOOLYWOOD, Japan, Linen, N.Hoolywood, Ron Herman, Slacks, Spring, Spring Summer, Spring/Summer, Suiting, Summer, VEST. Bookmark the permalink.